Lucknow the capital of Uttar Pradesh, extends along the banks of the river Gomti.The creator of Lucknow as it is today was Nawab Asaf-ud-Daula.The city became known as a centre for Urdu poetry and courtly diction, and reached its zenith during the reign of Wajid Ali Shah who was a connoisseur of music and poetry. 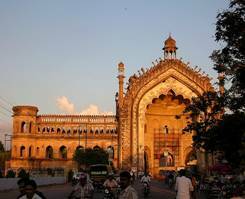 It was during his reign that the British appropriate Awadh.Today the city id dotted with remnants of its rich historic past.Lucknow is also known for its elaborate cuisine and "Chikankaari" or exquisite shadow work embroidery on fine muslin cloth. 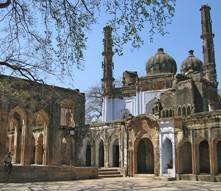 This is also popularly referred as "City of Nawabs". 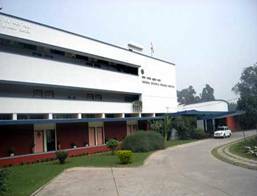 Lucknow in the state of Uttar Pradesh, India is situated on the northern Gangetic plains of India between 26.50o North and 80.50o East. 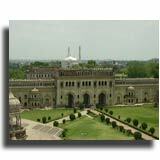 History claims that this is one of the most ancient Hindu states with rich cultural heritage and monuments.Lucknow being the centre of urudu language dates back to the reign of various Mughal rulers like Muhammad Amin Saadat Khan, Abdul Mansur Khan Safdur Jung, Amjad Ali Shah, and Wajid Ali Shah who ruled the state capita for more than hundred years. The original name of Lucknow was Lakhimpur or Lakshmanpur for it was gifted to Lakshmanan brother of Lord Rama after their period of exile from the forest. Lucknow Festival - This is one of the most popular festivals celebrated in Lucknow during the months of November - December. This festival is celebrated for a period of ten days and it mainly showcases the culture, heritage, arts and cuisines of the people of this state. The whole city is filled with enthusiasm and joy during the Lucknow festival. Vrindavan Sharadotsav - This festival is dedicated to Lord Krishna and it falls in the month of October.Vrindavan Sharadotsav is celebrated in the nearby town of Lucknow named Vrindavan.The temple is fully decorated on this day and people from different parts of the state visit this temple and offer their prayers. Other common festivals celebrated in Luknow include Holi, Diwali and Dussehra. Ramakrishna Math - Though this is not a place of worship it is supposed to be one of the ideal place for seeking peace and serenity. This was built nearly seventy years ago mainly for spiritual activities. The math is adorned with beautiful marble monuments and gardens. Sankat Mochan Temple - This temple is situated in the heart of Lucknow, Uttar Pradesh. The idol worshipped here is Lord Hanuman. The main feature of this idol is 6.5 ft and is made from a single piece of marble, which is visible from all corners of the puja hall. The temple is also noted for its astounding architecture, a perfect blend of old and new. It is supposed to be one of the most beautiful mosques in the whole of India. The most attractive feature of this mosque is that it is supported by 260 pillars whose height varies at different places which are beautifully carved with aesthetic value. It also houses the tomb of Sultan Ahmed Shah. Its courtyard encloses an area of about 4950 square meters. Christ Church - This church is dedicated to those who died in the revolt of 1857 and was designed by General Hutchinson. 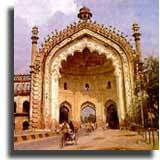 It is situated near Wingfield Park in Lucknow. Near the Rumi Darwaza, this structure houses the tombs of Muhammad Ali Shah, its builder and of its mother. 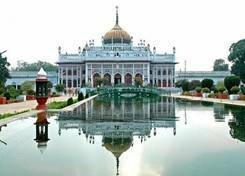 Built between 1837 it is also called as the Chhota Imambara.It is approached through a fine garden. 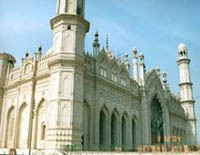 The imambara has a white dome and numerous turrets and minarets. The walls of the mausoleum are decorated with verses in Arabic.Cahndeliers, gilded mirrors, colourful stucco, the king’s throne and ornate tazzia or replicas of the tombs at Karabala adorn the interior. This white domed structure derives its name from the town of Najaf, about 200km south of Baghdad where the saint Hazrat Ali is buried. It is situated on the right bank of the Gomti.In this mausoleum are buried the remains of Ghazi-ud-din Haider and his wives, including Mubarak Mahal, his emperor wife. This is also known as the Bara Imambara which was built by Nawab Asaf-ud-Daula in 1784 and is one of the architectural highlights of the era. The central hall is said to be the largest vaulted chamber in the world. This colossal ornate gateway is said to be a fascimile of one of the gates of Constantinople. It was built by Asaf-ud-Daula in 1784, to create employment during the terrible famine of 1784. This was built for the British in 1780 - 1800; it was originally a very extensive and beautiful building. It was a scene of dramatic events during the war of 1857.The scared ruins tell the story of the British community besieged by the rebels. The main house overlooks the river and is surrounded by terraced lawns and gardens. 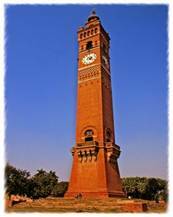 This is the biggest clock tower in India. This shares the campus of Rumi Darwaza.This Victorian-Gothic Clock Tower goes upto a height of 67m, and was designed in the 1880s, by Roskell Payne. The dial of this clock is shaped like a 12-petalled flower and has bells around it. This is located at Sikandarbagh where pitched battles took place during the mutiny of 1857; the institute garden is open to the Public from 6AM to 5PM. This is a favourite spot for recreation; Lucknow museum houses a large collection of artifacts and memorabilia and is situated in Banarasi Bagh within the zoo premises. 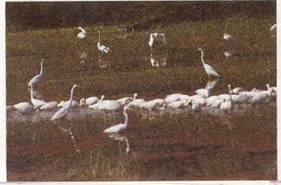 This is situated at a distance of about 45kms away from Lucknow, spread across 4 square kilometers and it attracts lots of migratory birds during winters. Some major local migratory and residential birds are Saras crane, Painted Stork, Peacock, White Ibis, Dabchick, Whistling teal, Open billed stork, Pheasant tailed jacana, Bronze winged Jacana, Purple moorhen, Lapwing, Tern vulture, Pigeon, King crow, Indian roller and Bee eater. Aminabad - You get everything under one roof here in this bazaar mainly jewelry and pickle shops. Chowk,old market - Chikankari cloths and antique pieces. Nakhas,Sunday Market - antique Paandan, Khaasdan,and popular bird market. Kapoorthala,Janpath - fashion jewellery and textiles. Lucknow is well connected with the other important towns and cities of the country by air. Almost all the private and public service providers have regular scheduled flights to the Lucknow. The main airport is Amausi that is about 15 km away from the main city area. Lucknow is connected by road with all major cities of the country. The national highways, NH 24, 25 and 28 pass through the city.The state transport corporation runs several buses that link cities like Bhopal, Delhi, Jaipur, Jodhpur, Agra, Varanasi and Mathura with Lucknow. Lucknow is well connected with the rest of the country by a large number of trains, including some of the best known passenger trains operating in Northern India, including the New Delhi bound superfast Shatabdi Express.